Eric L. Palmer - F-16.net - 19/11/08 - New Congress, New President and Future Air Power Risks for the U.S.
Ian McPhedran - Adelaide Now - 21/10/08 - Jets, helicopters, armored vehicles "cannot fight"
David Crane - Defense Review - 08/04/08 - U.S. Navy Aircraft Carriers Vulnerable to SS-N-27 Sizzler Anti-Ship Missile? News Report - Naval Open Source Intelligence - 04/04/08 - Secret U.S. ASAT? 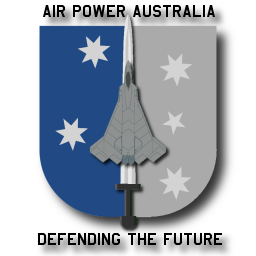 News Report - Defense Industry Daily - 20/03/08 - The Australian Debate: Abandon F-35, Buy F-22? David Axe and Bryan William Jones - World Politics Review - 18/03/08 - Are Unmanned Airplanes the U.S. Air Force's Salvation? Martin Sieff - UPI - 13/03/08 - BMD Focus: BrahMos for Israel? News Report - Taipei Times - 2/03/08 - EDITORIAL: The F-22 for the friend Down Under? Andrei Kislyakov - Moscow News - 28/02/08 - Will Arms Program Fall Short? New APA NOTAM - 19/02/08 - Why F-22A Raptor instead of F-35A Joint Strike Fighter? Andrea Shalal-Esa - UPI - 18/02/08 - UPDATE 1-Pentagon finds extra C-17 purchases "unaffordable"
News Report - Flight International - 12/02/08 - COMMENT: Should there be competition to power JSF? Jim Wolf - Reuters via The Guardian Unlimited - 08/02/08 - India said mulling missile-shield work with U.S.
Eric L . Palmer - Worldwide War Pigs - 08/02/08 - Opinion: Heavier tactical airlift for the U.S. Army? Stephen Trimble - The Dew Line - 08/02/08 - How much does one F-35 cost? Bill Sweetman - Aviation Week - 01/02/08 - Will the bomber get through? Loren B Thompson - UPI - 22/01/08 - Thompson Files: Biz execs at Defense Dept. Josy Joseph - DNA - 8/01/08 - Six planes for Rs5,000 cr: Are we paying too much? John Tirpak - AFA - 3/1/08 - Beyond "Back to Basics"